Ella Parry-Davies discusses a selection of physical and object theatre shows at Avignon OFF. Choses et Autres at Avignon OFF. France is known for its strong tradition of physical and image theatre that stretches from dance to nouveau cirque, object theatre to puppetry. Far from being ensconced in history, however, these forms are constantly subject to stretching, warping and re-invention by contemporary practitioners. Ella Parry-Davies selects the best of the shows using these practices at the Avignon Festival’s fringe sister ‘le OFF’. A man scoops sand into his palms, and lets it seep from between his fingers, catching a perfect beam of light so that it recalls the dust particles suspended in a slice of sunshine, or rain under a lamp-post. A young boy goes to war. Windows of a cupboard open and close, revealing patterns in the sky. Later, an apothecary pours sand from one container into another, weighs and measures, punches numbers into a till. Ever more frantically, he pours, weighs and punches, faster and faster, until his skull begins to dislocate, his face detaches and sand pours from his eyes: the tears of a wooden puppet. 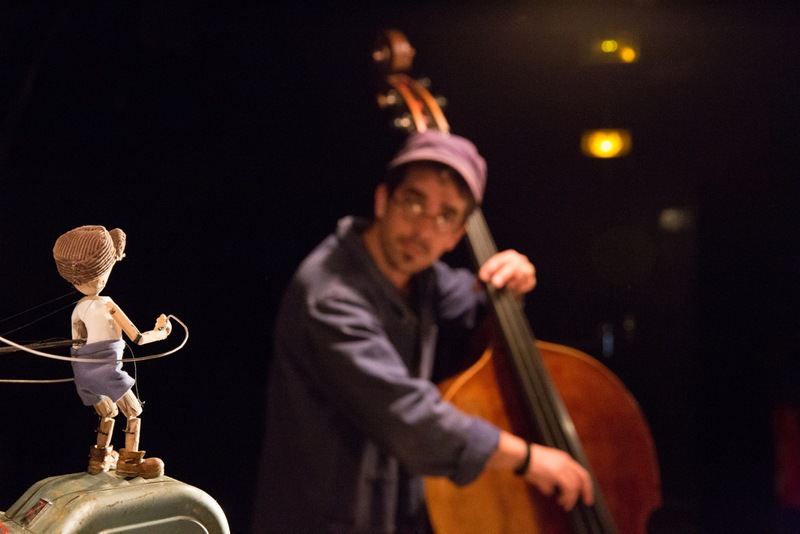 Choses et Autres is a cabinet of curiosities for an audience of twenty, delicately choreographed for puppets, double bass and thumb piano. Linking fragments of texts by Jacques Prévert, the piece offers snippets of worlds conjured by a striking variety of puppet forms and manipulated objects. Its aesthetic is carefully curated, both performers dressed in flat caps and factory-style blue overcoats. The small stage is crowded with objects that must have been discovered from years of searching through thrift shops and antiques warehouses: bells, weighing scales, cabinets, lampshades, all with the same worn charm. The musician uses pedals to loop the plucked and bowed double bass, building up an evocative ambient soundscape. Though the overall universe created is sensually coherent, the individual vignettes are only barely linked together through images such as the sand, and the theme of loss that gently recurs. What is lacking is a sustained trajectory, meaning the emotional investment I found myself starting to make in some of the more touching fragments dissipated quickly. The range of puppets used is impressive, and it is captivating to see storylines travel between physical registers (human, string puppet, glove puppet) and spaces on the stage. Despite being invited into a charismatic world, we seemed to hover over images, and could have been immersed more deeply in the carefully created scene offered. For those looking for something light-hearted — yet no less impressive — Déclinaisons de la Navarre is performed by a virtuosic duo who repeatedly recreate a scene that we hear but never see: an encounter that’s somewhere between a Jane Austen period drama love scene and your favourite Game of Thrones fumble in the forest (at least that’s what it sounds like). Loosely translated into “Variations on Navarre”, we first see performers Claire Laureau and Nicolas Chaigneau watching the scene on television from their sofa, before they re-stage it in increasingly innovative and absurd forms. Without giving the game away, on the menu is a variety of hilarious animal courtships, tongue-in-cheek takes on pretentious contemporary dance genres, and (my favourite) breathless grunting heard towards the end of the recording, revealed entirely innocently as housemates searching for a penny lost down the back of the sofa. The production could perhaps lose a few minutes, but given that it consists purely of the same scene interpreted again and again, it’s a testament to the physical and vocal skills of the actors that it kept my attention and kept me laughing. It’s simple but entirely slick, and you’ll know you’re in the safe hands of some impressively honed performers from the first gormless goggling — which in itself is enough to raise a giggle. If Déclinaisons de la Navarre played deliberately on flights between genres of performance, the opening scenes of Nativos switch between stylistic, emotional and cultural registers in a more confusing patchwork. The fruit of an encounter between Belgian-Argentinian choreographer Ayelen Parolin, and Korea National Contemporary Dance Company, the performance blurs elements of Korean shamanic practices with seemingly queer, satirical versions of the rituals. We are introduced to the performers as spirits of earthly elements corresponding to the four cardinal directions, by an MC-type figure who would belong more comfortably in an expensive karaoke nightclub, yet goes on to accompany the performance with traditional percussion instruments. The four male performers, however, embody their own diverse physical idioms. One is in women’s clothing, and walks slowly across the stage with the heaviness of an aged female body. The tortured micro-gestures of another conjure the urgency of a boy on the brink of crisis. Yet as the performance gathers momentum, the code-switching that I found unsettling at the opening dissolves into a gruelling regime of repetitive movements enacted by all four dancers. Resembling martial arts practices, these gestures are relentlessly executed with impressive precision that — it is clear — becomes increasingly strenuous to attain. The effort of these bodies surpasses the stylised conventions of the opening scenes, leaving the dancers bare to absolute fatigue. I stop trying to unravel relationships and locate places and times, and slip into a sort of trance-like state in which there are no characters, no earthly or thematic cardinal points: just the exhaustive labour of unremitting movement. This is one of those productions that leaves the audience slightly shell-shocked — one of those endings that is followed by a pause, before erupting into long and satisfying applause. Avignon OFF is on until 30 July 2017. Click here for more details.